6,000 Closing Cost Assistance INCLUDED for qualified buyers. Best Priced New Homes in Kent County. Kennedyville is located in the heart of Kent County and a few miles north of Historic Chestertown. The community is close to water access on the Sassafras River and a short drive to Delaware’s tax-free shopping areas. 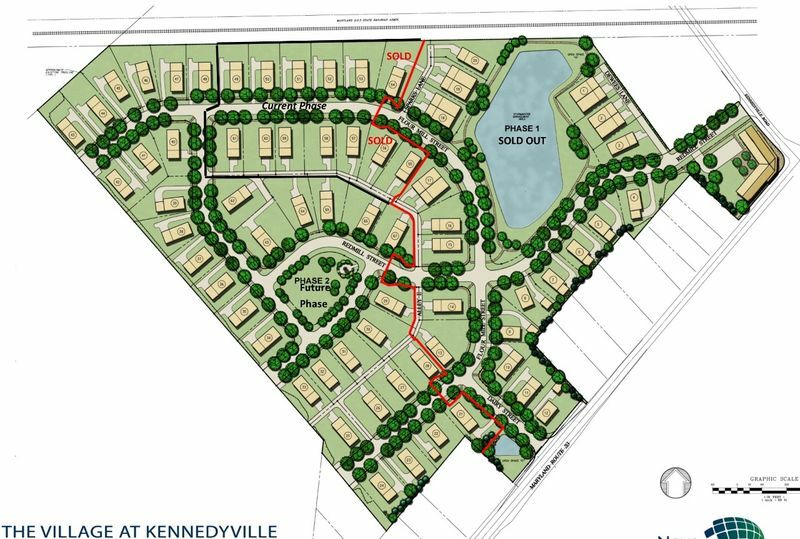 The vistas from our Kennedyville community include the small village of Kennedyville and the beautiful rolling farmland that surrounds it, much of which has been permanently preserved. Now taking lot reservations. The central location of Kennedyville allows residents easy access to Chestertown, Rock Hall or Galena. Kennedyville Road leads to Turners Creek Park which gives boaters access to the popular recreational and fishing area of the Sassafras River. Homes are designed to integrate with the existing home styles of Kennedyville. All of the homes include front porches and the community has tree-lined streets with sidewalks. This creates a walkable close-knit community. The central pond is surrounded by a walking path which, over time, will become a wonderful nature walk. As the community grows, we plan to build a commercial building within walking distance which will house a deli and convenience store. Must use our Lender and title to received closing assistance. Community includes base standard features, contact salesperson for details.